We’re pretty excited that our very own Jenny Trent will be presenting at the BioCycle East Coast 17: Growing the Organics Recycling Industry on April 5, 2017. Trent’s presentation will offer an inside look at the Rural Iowa Food Waste Reduction Project, a year-long project working with industrial, commercial and institutional (ICI) facilities in Iowa made possible through a Solid Waste Management grant from the United States Department of Agriculture Rural Development. Of particular focus in the presentation will be the ICI category that was most receptive to learning about their food waste and making changes to reduce it - K-12 schools. Trent will highlight data acquired by working with students, staff, teachers and administrators to sort cafeteria waste into categories that included plate food waste, kitchen food waste, recyclables, compostable, metals, and non-compostables/non-recyclables. Throughout the project, we worked with 29 schools across the state and conducted cafeteria waste sorts in 17 schools. 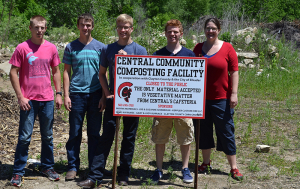 Trent worked closely with one school district in particular that has become a leader in K-12 food waste reduction: Central Community School in Elkader, Iowa. Trent will describe Central Community School’s challenges and successes in reducing food waste and the assistance provided to the school through the project. Led by five junior and senior students, Central Community School faced many challenges to reducing food waste, but the students persevered and turned challenges into great successes which are highlighted in a case study. Trent’s focus will also showcase the results from the numerous cafeteria waste sorts conducted throughout the year-long project and the staggering amount of school food waste sent to the landfill. Lastly, Trent will discuss the importance of obtaining accurate factors for each ICI sector to help estimate food waste generation rates so that strategies and techniques can be identified that will help prevent and reduce food waste. Why: To showcase the results, highlight successful schools and offer insight for future food waste projects in rural communities. As always, you can find more information about the Iowa Rural Food Waste Reduction Project on our website at http://iwrc.uni.edu/food-waste/rural-iowa-project and be certain to check out the March/April issue of BioCycle for a more in-depth discovery of the project finds.